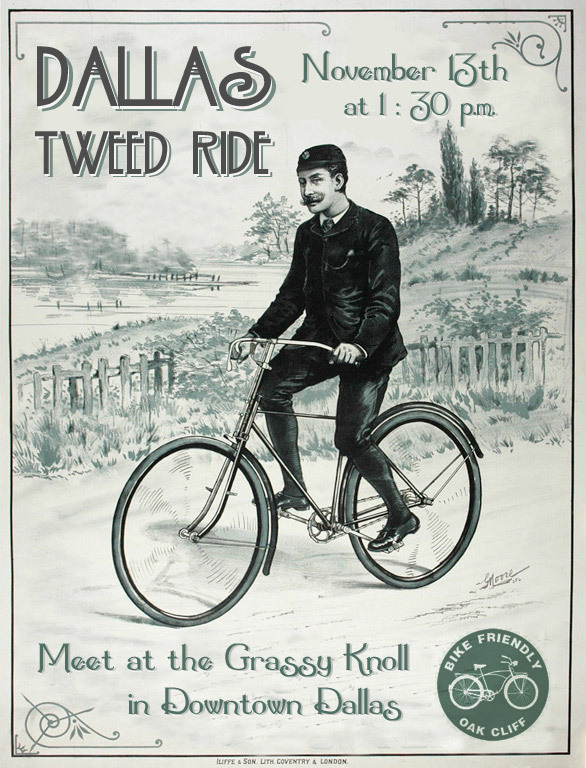 Once again, it is time for Dallas’s 3rd Annual Tweed Ride! Don your smartest apparel and make haste to the grassy knoll in Downtown Dallas (at Dealey Plaza) on November 13th at 1:30PM. The ride will take us through historic Oak Cliff with stops at the Turner House for lawn games and merriment, the Bishop Arts District to stroll the outdoor market at CliffFest, and finally returning to Downtown Dallas. This ride has become an institution in Dallas bringing out over one hundred chaps and lasses all wearing their finest knickers and caps. Last year’s event included dancing, tug-of-wars, umbrella jousting, cucumber sandwich tosses, and beer relays. Expect all of that and more as we prepare for another rousing ride through our fare city. Sounds good, Jason. I did the first Tweed Ride, but came in my Spandex bike pants and cycling jersey. Talk about a pair of brown shoes with a Tuxedo!! !